The King of Fighters '94 © 1994 SNK. 24 selectable characters in fixed teams of three clash to defeat Rugal Bernstein. 2 players - 4 buttons per player. 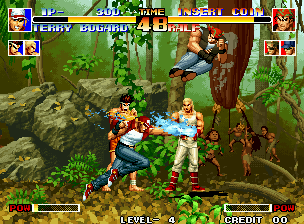 The King of Fighters (or KOF for short) revolutionized the fighter genre with the introduction of 3 member team fighting called the 'team battle system', and by combining elements of two of SNK's existing fighting game in "Fatal Fury - King of Fighters" and "Art of Fighting", as well as bringing back characters from games predating the MVS in "Ikari Warriors" and "Psycho Soldier". A new game in the series is produced every year. At the demo previous to the first Rugal encounter, Rugal shows your team the statues he has gathered by turning his opponents into them. One of the statues is of a guy that looks a lot like Capcom's Guile making a Sonic Boom. Capcom later confirmed that it was indeed Guile's statue in "Capcom Vs. SNK - Millenium Fight 2000". When Guile fights Rugal that statue is shown and later destroyed by Guile. Kyo Kusanagi : Since Kyo was created as a snazzy character capable of holding his own against the main characters of "Fatal Fury - King of Fighters" and "Art of Fighting", coming up with the right design was quite a lengthy undertaking. Kyo's personality remained a mystery until the final stages of development. Originally, he was to be called 'Sho Kirishima', but during the latter stages of development, his designers decided on the name of Kyo Kusanagi, and Sho got a rapid name change. The setting for the Orochi Saga, in which we learn that Kyo's ancestors defeated the Orochi of the Yamata, began with this game. Benimaru Nikaido : This character was loosely based on a comic book character (Jean-Pierre Polnaref from "Jojo's Bizarre Adventure"), and even after the name of Benimaru was decided on, game developers gave the poor guy an identity crisis by continuing to call him by the comic book character's name. The voice for this character, too, had a peculiar bent to it, and when Benimaru's designer heard his creation's victory line of 'Thank you' recited for the first time, rumor has it that he couldn't work for days after : the reading had nothing to do with the character's original image. His speech patterns have led some to question Benimaru's preferences as far as certain lifestyles are concerned. Goro Daimon : This character comes from the designers' desire to create a judo athlete who uses dynamic body tosses. His initial designs incurred the criticism of some fellow designers who were of the opinion that it was just plain loopy for Daimon to fight wearing Japanese geta (wooden clogs), but Goro's creators were adamant and he kept his footwear. The suggestions for his laconic victory lines and the sound of an explosion when Goro is victorious also stuck. Terry Bogard : When the concept for KOF was first formulated, Terry was tacked on to the roster as an afterthought, but his popularity skyrocketed! He became the character who got the designers' utmost attention, and they fretted over various aspects of his character. In the first KOF, Terry became the powerhouse, getting a super punch cancel move added to his arsenal and becoming the fearsome character he is today. Andy Bogard : Compared to Andy's original form ("Fatal Fury - King of Fighters"), Andy changed little in his move to KOF, but what he got in return was the addition of his Ultra Disruptor move to his arsenal of moves. When first added, it boasted overwhelming power : it was easy to use, never missed, trumped other moves, and annihilated all opponents. Joe Higashi : Joe is a character who underwent a major image makeover from his transition from "Fatal Fury - King of Fighters". The victory pose of KOF '94 initially lacked the toothy smile we're familiar with now. It was quite a thorn in the side that we felt inappropriate for Joe's legion of fans. So, in rethinking the original design, we added the pearly whites that makes Joe to loveable character he is today. Ryo Sakazaki : Ryo (as can be said of all characters from "Art of Fighting") has so many Special Moves that it seems almost unfair to the other characters, and in the designing stage, the Art of Fighting team tended to be the strongest. The designers focused on adjusting this imbalance without taking out any moves, but in the end Ryo and his team remain the toughest competitors. Robert Garcia : Overall, KOF's characters are fit and trim, but compared to their original concepts, Robert is the slimmest of them all. Matched up against Kensou, he chide his adversary in Japanese with an Osaka accent, allowing players to enjoy the amusing word play that Osaka comedians are known for. Takuma Sakazaki : Since the Takuma of "Art of Fighting 2" closely resembled Daimon, he received a karate tunic in his ensemble to set him apart and that's why he looks the way he does today. He originally had a combo attack after the 'Super Shrike Gale' move that appeared to be a glitch. Hence, during game development, this move was taken out, but the game designers thought that he just wasn't Takuma without this move and it was put back in. The designers slightly regret their decision because Takuma's become quite a mean little bugger as a result. Yuri Sakazaki : Yuri is a disciple of Kyokugen Karate but her appearances in the KOF series are frequently as a member of the women fighters' team. Originally in KOF '94 there was no such team and production began on King Billy Big Bear as the English team. But "Art of Fighting 2" was completed at that time and the designers pressed to put Yuri into KOF, replacing her with Big Bear, who was presenting various problems, for various reasons (hah, hah) concerning capacity. Enter Yuri, goodbye Billy! (A tragedy, we know) And so the originally planned team started life anew as the mighty women fighters' team. Heidern : Heidern was devised as a cold-blooded killing machine when he first saw digital life, but as the KOF story unfolded, Heidern's designer identified with the character and provided him with a tragic past. When his super special moves were completed, the moves were so wild that game designers worried that he would have to be depicted as a sorcerer or an alien in order to explain his dazzling moves. Ralf Jones : In the first stages of Ralf's development, he appeared shirtless to truly express the feeling of ikari or rage, but during the designing phase, someone felt his look was a bit dated and Ralf got the apparel he's now known and loved for. He originally had special moves that allowed him to use grenades, setting him apart from other team members, and a distinctive design, but his use of grenades in a fighting competition was deemed a bit unfair, so he lost that particular talent. Clark Steel : At the beginning of development, the only differences in designs for Ralf and Clark was one had a hat and the other had a bandanna, but Clark later got a pair of sunglasses to become the character he is today. Clark basically looks a lot like Ralf, but since the designer in charge of adjusting this character worked on his hit accuracy, action speed and attack strength, their combat style is where the true differences between the two can be found. Athena Asamiya : Given that Athena is always the most highly anticipated character of the series, the pressure to keep her on the roster at any cost is pretty overwhelming. And because SNK staff focuses so much on her, SNK have been accused of favoritism. Japanese fans asked SNK to dress her in a sailor blouse and skirt, but we scrubbed that idea because SNK felt it wouldn't translate overseas and be a bit too risque. But SNK made up for that omission with her wild entrance actions (Hubba! Hubba!). Sie Kensou : Compared with Athena, Kensou's design has been a bit slapdash. In the previous title, Athena stole the show and since we felt Kensou was a bit too overshadowed by her, SNK gave him a radically new look to appeal to our female fans. We're often asked about Kensou's use of Japanese with an Osaka accent in the game, but he's always done that since his Psycho Soldier days. In other words, he's been doing it far longer than Robert has. Chin Gentsai : When SNK first decided to try our hands at a fighting game, SNK felt we just had to have a geezer who used the Drunken Fist form of martial arts. Getting the OK, SNK introduced this character as Athena's teacher. As we aimed to create a genuine Drunken Fist master, SNK thought it would be hard to get the right touch, but since designer was good at drawing old guys, the finished product far exceeded original expectations. Unfortunately for the designer, he was unable to shake this habit and all of his subsequent characters tended to look like spry old men. Mai Shiranui : Regarding Mai's familiar pause action... One day, the designer for Mai asked if it was all right to increase Mai's pause actions, and because the powers that be thought there was enough remaining memory for the game (actually there wasn't) they said, 'Go for it'. When the completed pose was presented, it knocked people flat. Due to this pose's potency, however, Mai's eye-popping motions were stilled in the KOF '94 international home version. King : As far as King's super special moves go, there were various reasons why the 'Surprise Rose' was initially scheduled to be scrapped. Just when the development staff was worrying about coming up with a move that was something different, though, King's designer whipped this move up, it was well received, and it became her super special move, with no alterations needed. Heavy D! : Since there has been a number of boxers in fighting games, Heavy D! was designed with the intent to create a different type of pugilist. When he first appeared on the drawing board, D! was not intended to be that big a character, but as he evolved and stood among the other characters it became apparent that he was one huge dude. ...Due to certain production circumstances, however, D! kept his imposing stature and came to be the character he is today. Lucky Glauber : Known as the basketball fighter, Lucky's original image was based on the character appearing in the Bruce Lee movie, 'Game of Death'. Though originally created with that image in mind, his first design was deemed too plain and he then received his current look. His ability to use karate, though, is a remnant of his original conception. Brian Battler : Brian came into being well before the KOF project came down the pike, and he's one of the oldest characters. He originally wore a helmet and chest pad, but he shed that equipment to arrive at his current design. Kim Kaphwan : At first, the duo of Chang and Choi were set to team with another vicious criminal to form the Fugitive Team, but due to certain circumstances the third criminal was replaced with Kim and the familiar team came into being. The addition of Kim was considered somewhat forced, however, so Kim received the mission of rehabilitating the two. Chang Koehan : Chang was originally far more violent than he is today, but once he teamed up with Kim, he became mellowed a bit. Chang's super special move, the Wild Ball, was originally designed as a test move, but it got such a good response that it was put into the game without alteration. This move is a pastiche of Kim's Phoenix Kick. Choi Bounce : Choi is KOF's mighty novelty character. His original design looked way too much like a certain someone, so he was hastily given a new look a month before the final character designs had to be completed, giving Choi's designers one major headache. The first time Choi displayed his attacking and retreating moves and rolled around the screen, he revealed not only his fighting abilities but his talent for physical comedy. An interesting thing about Chang and Choi : Chang was the tallest and heaviest KOF character, while Choi was the lightest and shortest. The duo is very popular in Japan, but hated by American fans. Because of their size differences, they have made a (quite) comedic couple, making the Korean team (or the Kim team) the comedy-relief team of KOF. Rugal Bernstein : The concept for this character at the time was to make the mightiest (most violent) and most evil boss character ever. As everyone knows, Rugal is the King of Bosses who boasts the most appearances in the KOF series as a boss character, but even considering the whole genre known as 'competitive fighting games', his story and moves have changed ever so gradually while appearing in so many titles, he's one of the few bosses to have been loved (heh, heh) over such a long period. Ralph and Clark are playable characters in the Foma 90x Series Mobile Phones game 'Metal Slug Survivors'. Brazil Stage's background music (Jungle Bouncer) samples "Surprise! You're Dead! ", a song from Faith No More (1989). The background music from USA Stage (Slum No. 5), Japan Stage (Esaka) and the 2nd Rugal Stage (Showdown R & D) all contain voice samples from "Gutfest '89", a song from Digital Underground. Pony Canyon / Scitron released a limited-edition soundtrack album for this game (The King of Fighters '94 - PCCB-00162) on 21/10/1994. * Select Victory Pose : Press a Punch or Kick button immediately after winning a match. * Beat the game without continuing to see all the characters grouped together on the The End screen. [US] Sony PS2 may.05, 2008 "SNK Arcade Classics Vol.1 [Model SLUS-21724]"
[US] Sony PSP may.05, 2008 "SNK Arcade Classics Vol.1 [Model ULUS-10338]"
[KO] Sony PS2 may.29, 2008 "SNK Arcade Classics Vol.1 [Model SLKA-25424]"
[US] Nintendo Wii jul.29, 2008 "SNK Arcade Classics Vol.1 [Model RVL-P-RNCE]"
[EU] Sony PSP Oct. 17, 2008 "SNK Arcade Classics Vol.1 [Model ULES-01105]"
[EU] Nintendo Wii Oct. 31, 2008 "SNK Arcade Classics Vol.1 [Model RVL-P-RJZP]"
[EU] Sony PS2 Nov. 21, 2008 "SNK Arcade Classics Vol.1 [Model SLES-55232]"
[JP] Sony PSP May. 21, 2009 "SNK Arcade Classics Vol.1 [Model ULJS-193]"